Active fun for play in the backyard, sidewalk or park. Covered bin for hauling toys. 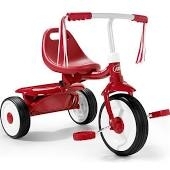 Safety controlled turning radius and low center of gravity. Steel frame for strength and stability. Ages 18 mos to 3 yr. Styles and colors may vary.